and were able to take one of four different courses, taught by dons of the various colleges. I took a course entitled “Medieval English Society”, taught by Dr. Mark Bailey, of Gonville & Caius College. Before we arrived, we were given a reading list of various works about medieval society in general, and English society in particular. We were also given the opportunity to write a paper on one of a number of topics relating to the subject at hand (the instructor included some suggestions). Those of us who were taking the course for college credit were required to write a paper, and the rest of did not have to, but I decided to do it anyway. I have always been an early-music fan, and I decided to write a paper on medieval music, knowing that most of the music conventions we know today had their origins in the medieval period in Europe. So I picked up a couple of books on medieval music to read ahead of time, and found a nice cassette tape of Gregorian chant to play for the class. When we arrived, after the first class, we were scheduled for a private meeting with the instructor to discuss our paper topic, if we were doing one. I had a very nice chat with Dr. Bailey, and he was enthusiastic about me writing a paper about medieval music, and said “You may teach me something, since I know nothing about medieval music”. So I got started shortly thereafter. I decided to use the format of a “timeline” of both music and the wider society, to tie the developments in the musical world to what was going on in the wider world of the time. 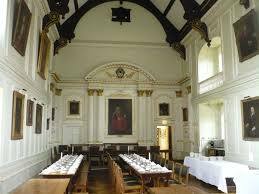 and had a tot before dinner in the college bar (yes, Trinity Hall has its own bar). We went punting on the River Cam, and took tours of some of the other Colleges. At the last class period, those who had written papers did presentations of them for the class. One of us had been very secretive about her topic, and it turned out that she had been going to one of the local churches, and done a “rubbing” of one of the brass grave-markers of a local knight. Her rubbing was taller than she was, and it was just beautiful. I got much applause for my presentation on medieval music, and I felt it was a fitting end to a wonderful class. I figured that my followers and readers might like to read my paper, so here it is (with some more-modern embellishments than I had available in the ancient times of 1991). Music has played a role in peoples’ lives from earliest times. Egyptian and early European art depicts people playing instruments such as the harp. Music accompanied much Greek and Roman entertainment; unfortunately, little is known about it since it was not written down. Greeks, in fact, had a very advanced music theory, to which medieval composers and theorists often referred. The Middle Ages was a time of great changes in music, the Church, and in English society, with changes in one area reflected in others. At the start of the period, the Church was a dominating force in English society. The first Benedictine monastery had been established in Lindisfarne in 635, from whence the monks began their mission to convert the Anglo-Saxons to Christianity. Music played a prominent part in the early Church; from the time of its establishment the unaccompanied singing or chanting of psalms was a feature of Christian worship. At first this singing was very simple, normally all on one note, with inflections up or down at the beginning or end of a phrase. As an aid in singing these chants, marks known as “neumes” were placed above the text, indicating whether the melodic line was rising or falling. The choir director also used hand signs to guide the singers. Noticing that, as time passed, chants and the rest of the service were growing more complex and subject to wide regional variation, in about 590 Pope Gregory I attempted to organize a uniform Roman liturgy, hence “Gregorian” chant. He also established the Schola Cantorum in Rome, to train teachers and singers. In the eighth and ninth centuries, the pace of change accelerated. Monasteries were becoming centers of learning, and this included music. Monks all over Europe were studying the ancient Greek music theories, and composing myriad new melodies for their chants. The monasteries were also becoming quite wealthy, due to endowments by the local aristocracy (when a lord or his lady died, money from the estate was donated to the monastery for the monks to say prayers for the family). Around the year 850, a “Musical Handbook” described a more advanced chant, with two parts paralleling each other at intervals of a third, fifth, or octave. This came to be known as the “organum” style. With this, new words began to be added to the texts. Chants were now complicated enough that memorization was becoming nearly impossible. 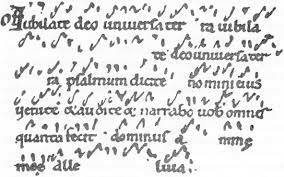 Around the year 1000, a monk called Guido of Arezzo fashioned a system of lines for the neumes, to indicate the pitch above or below a reference note. This marked the beginning of the development of modern music notation. The next century brought a number of important developments in society, the Church, and music. The Mass achieved a relatively stable structure, being composed of invariable texts, called Ordinaries, and texts which varied with the day of the ecclesiastical year (Propers). Texts were originally taken from the Old and New Testaments, but were continually being revised and added to. During the eleventh century, a trend toward increasing complexity became more evident. The changes and additions to the Mass, including many new melodies; the Papal reforms of Leo IX in 1046 which made the Papacy an international institution; the Norman Conquest of England in 1066 and the Domesday Book in 1086-87, which imposed a new way of life on the population; and the further ornamentation of architecture that characterized the late Romanesque period. This was an especially rich period for musical developments. In secular music, goliards and jongleurs entertained the people with their characteristic song and dance music. Goliards were an educated group, often student ecclesiastics who had not yet taken priestly vows, who wandered through France, Germany, and Britain. Jongleurs were “jacks of all trades”, entertaining patrons (often scandalously) by singing, playing several instruments, and especially using the vernacular language (unlike the educated Goliards, who composed and sang in Latin). After the Norman Conquest, in Britain these performers were called Minstrels. Their songs were called “chansons de geste”, and consisted of accounts of heroic exploits. An important feature of the songs of the goliards and jongleurs was that they only contained one melody line. As far as Church music was concerned, the Gregorian chant was becoming more ornamented, with more notes per syllable, and a wider range. Also introduced around this time, to an enthusiastic reception, was the “Church Opera”, a musical dramatization of a short Biblical story. The system of musical notation was becoming more refined, with the addition of a rudimentary “clef” to indicate which note a staff line represented. This was especially necessary when the music was in more than one part. Again, Guido of Arezzo contributed this development. The returning Crusaders had brought with them a variety of new instruments, both bowed and blown. These included the bowed Rebec and Vielle (ancestors of the violin and cello), and the shawm, a predecessor of the oboe. 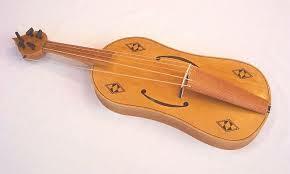 Already in use at the time were the harp, organ, kithara, and psaltery (in Church); and the lute, bagpipes, trumpet, horn, and various percussion instruments (secular). The end of the eleventh century saw somewhat of a reaction to the radical developments that had taken place in the Church and church music. In 1098, the Cistercian order was founded, to try to return monasticism to its roots-to bring about a more personal relationship with Christ. The rise of the cult of the Virgin Mary also occurred at this time. In music, the St. Martial school at Limoges, France developed organa with rhythmically-independent parts; the Notre Dame school introduced a new system of basic long and short note values, with written notes being given both accent and meter; and the monastery of Santiago de Compostela in Spain was experimenting with three-part organa. 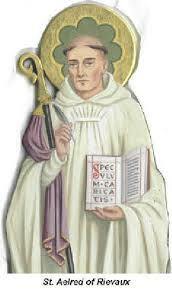 Unfortunately for Aelred and his cohorts, the movement toward more sophisticated music could not be contained. 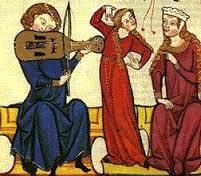 The twelfth century brought further advances in society and music. 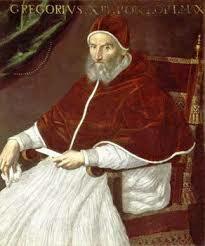 Universities were established in Bologna and Paris, leading to the decline of the wandering Goliards. The Crusaders had brought with them knowledge of ancient Arabian science and philosophy, and study of these took root in the monasteries, and in the new Universities. Troubadours and trouveres sang their songs of love in aristocratic court settings all over Europe, but especially in France. These poet-composers were often of noble blood. Indeed, Richard the Lionheart was said to be a fine troubadour. Many of their songs have been preserved, as have the English dances (estampie) of this period. 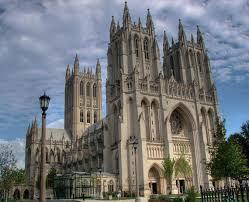 The thirteenth century ushered in a period of convergence of sacred and secular styles of music. Part-music filtered out of the church into the popular arena, and a new style, the conductus, with two or three newly-composed parts (as distinct from variations of older themes) was introduced. The motet, a complicated form of conductus where the parts had different words, was also a product of this fertile period, and many composers contributed elaborate examples. Here is a very famous medieval song, one of the earliest known, Sumer is Icumen In (the Cuckoo Song). 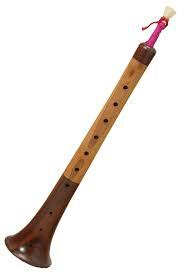 It can be seen that a great variety of musical forms existed contemporaneously. They demonstrated a flexibility of melody and rhythm which required a better system of notation. Around the year 1250, a monk named Franco of Bologna developed a new notation system, which included a greater variety of available note values, including rests. Other exciting events of what has been called the “medieval renaissance” included the establishment of the University of Cambridge in about 1209, Magna Carta in 1215, and the rise of Gothic architecture. One saw an increasing naturalism, with the portrayal of plants and animals on decorated buildings. 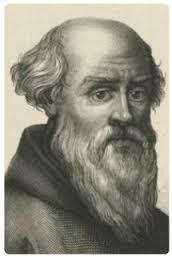 Latin translations of classical works were beginning to appear, Roger Bacon was contributing his scientific ideas, and towns were coming into their own as centers of commerce, government, and learning. The last great period of the Middle Ages was characterized by sweeping changes that drastically altered the face of Western Europe. Early in the 1300s, bad weather caused a severe decline in agricultural productivity, and depressed the morale and general health of the people. In the Church, monasticism entered a period of decline; with the agricultural recession causing a decrease in endowments; a phasing-out of child oblation; and a decrease in the prestige of the monasteries. In many areas, the monasteries were increasingly accused of engaging in arrogant behavior, and the communities’ reaction to this was demonstrated by such things as the “Roman de Fauvel”, a satirical poem attacking the Church, and the attacks on the Abbey of Bury St. Edmonds. There was a decline in the “community” in favor of the individual, and abbots began to become more secular, living separately from their monks. In 1378, this trend culminated in the Great Schism, with the Papacy being divided between Rome and Avignon, France. Medieval society was also irrevocably altered by the plagues which ravaged Europe, decimating the population and upsetting traditional feudal relationships. Increasing mobility of the people, in part caused by attempts to escape the plague; the rise of widespread wage labor, giving free peasants some measure of leverage over landlords; government experiments with taxation methods, leading to peasant uprisings; and the increasing power and influence of towns and their merchants and burghers. All these changes were indicators of a society that was to give greater emphasis and responsibility to the individual, eventually reaching its peak in the advances of the Renaissance period. In music, this was a time of consolidation and innovation. There was a more general use of instruments in addition to the voice (including the more modern organ with a keyboard). A new song form, the madrigal, made its appearance, its accessibility increased by the fact that it was sing in the vernacular. Philippe de Vitri (1316-1325) introduced his “Ars Nova”, which described a new, more-flexible notation, emphasizing duple time, and making possible a greater variety of rhythm patterns. Syncopation became more widely used, and deVitri also introduced a forerunner of today’s key signature (at the beginning of every staff line). As a result of Pope John XXII’s ban on the use of the motet in church (1324-25), composers turned more toward secular writing, and were concerned with the “vertical” aspect of their melodies, i.e. how the parts ft together into a unified whole. The forerunner of the harpsichord was developed in England, and French music was even featured at the court of the French Pope. In general, the period of the Middle Ages saw the gradual transition from ancient to modern forms, in social structures, the Church, and in music. 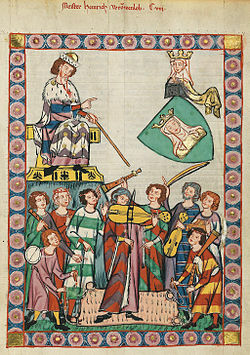 The decline of feudalism and rise of agricultural capitalism; the de-emphasis on authoritarian Christianity and monasticism and strengthening of the secular clergy; and the advances in musical forms and notation all are indicators of a trend toward freedom, knowledge, and the power of the individual. At the beginning of the Middle Ages, music was mainly heard in church, and Gregorian chant was very simple, with not need for accompaniment or a written language. By the fourteenth century, music could be found in every corner of society, a plethora of instruments was in general use, dozens of composers were generating many new types of multi-part church and secular compositions, and the system of notation was modern enough to enable new pieces to be easily taught, learned, and disseminated. Truly, this was a time of momentous accomplishments. Finally, here is how a very modern English musical group, Steeleye Span, interprets an Medieval Christmas song, Gaudete. Good piece, RushBabe. I really liked the Steeleye Span video too. Thanks for sharing this, Rushbabe! Loved reading it, learned lots, and loved the examples you provided! I’m glad you liked it. It was written in longhand, and it’s been a long time since I’ve had such a bad case of writer’s cramp. Love this, RB! especially the illustrative clips…Steeleye Span is an old favorite! Thanks and: “More, please…”. Thanks, Nanda. The paper took a lot of work, but I had time to do my research while I was there and before I left to go there. I have an idea for a new post, but I haven’t started yet. Stay tuned (and send all your friends). Wonderful historical perspective on the origins of medieval music! Since a good third of the music part is jibberish to me– my hearing is simply not good enough– the part that has me excited is that you went “punting.” What was it like? I only know it EXISTS from Peter Whimsy novels! It’s one of the stations I use to get the kids to sleep, or as mild background sound. My husband also has a few CDs of modern hits redone in Gregorian chant style that we use to game to. I have pictures in my three Cambridge albums of our class punting. The River Cam is very calm and shallow, and the flat-bottomed, snub-nosed boats called “punts” can be directed by a standing person with a long pole in the stern. 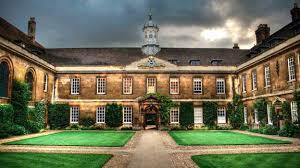 As long as you are still a Ricochet member, go over to the Member Feed and read my August 30 Cities post about Cambridge. I put some pictures there. Hubby has a flat-bed printer/scanner, and I can scan in more of my prints (3 X 5 from 1991!). I guess I’ll just have to a Cambridge post here to show them all off. About the music, you don’t have to be able to listen to understand. The main point of my paper was that all the elements of written-down music that we know today (staff, notes, rhythm, meter, key-signatures) were developed in the Medieval period, mostly by monks in the monasteries of Europe. And thanks for the link! One more thing. I have a beautiful CD of the Kiev Christmas Liturgy, sung in Russian by a choir of male voices. That is absolutely sublime, and you should look it up. I think you’d like it. People often overlook the advances in music, thinking of it as some sort of intuitive thing. Sadly, my study of theology was unqualified, since music is an integral part of the quadrivium that people wiser than me see as an essential first step, and I’ve never understood it. As such, I always appreciate the small windows of knowledge I get from fascinating posts like this. Thank you.